As you know we have been working around the clock to get things under control in this house. Just to recap, we made a deal to come here last October and rehab my grandparent’s old place that my cousin had been in since 1993 when my grandfather passed away. She passed away in 2014 and the house sat. Sigh. The hard part was that my uncle did not have a real clue as to how bad the house was under the “clutter” of my cousin’s things. He was trying to work on it, still work and take care of my aunt who has Alzheimer’s disease. So as you can imagine, it wasn’t getting done. He told us it was going to need some cleaning out, paint and a little TLC. Let me just say that my uncle had no real idea and that if we had not had our elderly animals with us, we would have turned around immediately gone back! Even working long hours and at a fast pace it took us over 6 weeks to trash and donate the clutter so we could even get started. The house ended up needing EVERYTHING! from the foundation up. We have now replaced ALL fixtures, electrical, plumbing, cabinets, windows and are almost done with the flooring as well as everything in between. Our things had been in storage for several years and quite honestly we have been OVERWHELMED dealing with ALL of gram's and gramp's things and all of Beth’s things too as well as ALL of ours now in the midst of a MAJOR construction zone. But the construction zone has become a home - I can cook real food and move forward with getting settled in! Our home is still full of boxes full of things that need permanent homes and I’m still a little bit overwhelmed. Even though we don’t have a lot of stuff (we’re still currently missing crucial furniture - sofa, chairs, coffee table), we have a ton of stuff. Seeing everything piled high and wondering “Where am I going to put this?” is exhausting for both of us so we’re going to do something about it. We’ve been making regular trips to our local donation sight, but it’s NOT enough. I’ve been setting aside anything that could be sold on Ebay, but that pile is HUGE and I want a fresh start. So this is like the shampoo bottle says, Lather, Rinse and Repeat. 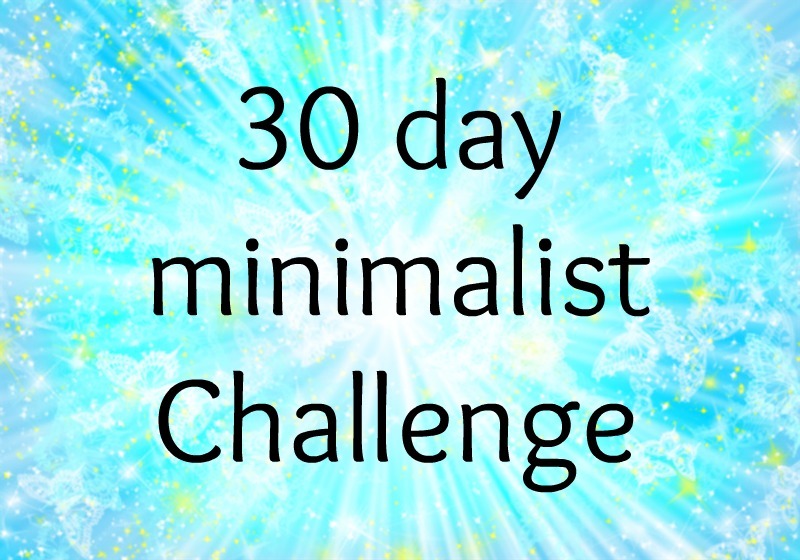 So here on day 180, our 6 month mark as a house warming gift to ourselves, we’re beginning a 30 Day Minimalist Challenge. For the last 6 months we have been living VERY basically so believe that we won't even miss many of the things we choose to get rid of. 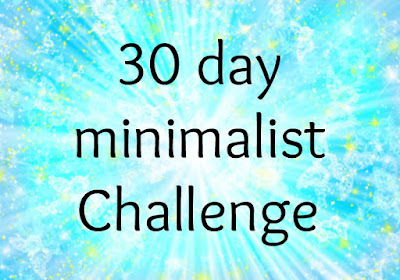 Even though we already got rid of TONS of things, I bet I can still meet this challenge. I originally found this idea on a blog about 2 years ago. It’s pretty simple, and brilliant, really. Every day, for thirty days, you remove (trash, donate, or sell) items from your home. And so on, until you reach day 30 and are removing 30 items. That's AT LEAST 465 items we'll get rid of. One of the hardest parts is keeping the inventory list, but I just found a clip board and put an old spiral notebook on it to keep it handy for the month to come. 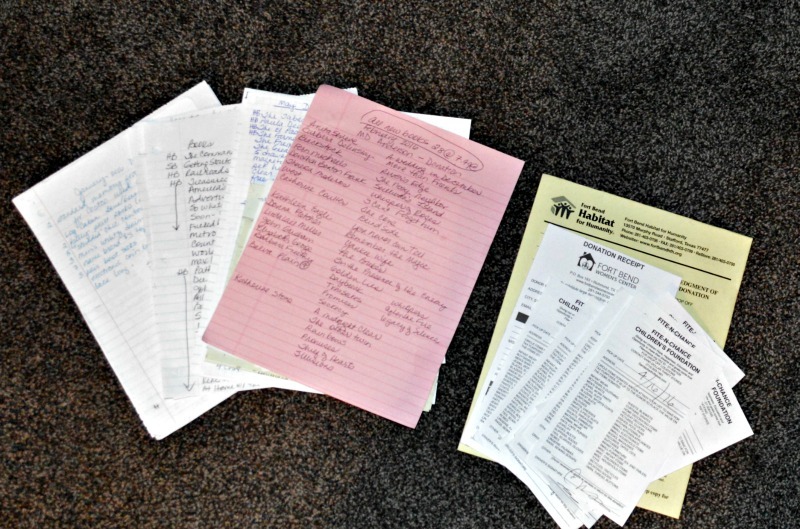 Donation inventories and receipts to date for 2016 - hope to double this over the next 30 days. BTW that's my new carpet those pages are laying on, do you like it? Love the new carpet my Dear! I can't believe it's been 6 months already. Wow! You guys are amazing and have such tenacity. So impressed. Thank you so much. It really is amazing what we DON'T need in our lives. And I just love the look of appreciation on the faces of the people at the habitat and women's shelter resale shops when we pull up with these huge loads. The guys at the habitat in particular have been super awesome. The other day while I was there donating I found some awesome cabinets for hubby's garage to move it forward. NOT only did they hold them for me, they made me the SALE of the CENTURY on them. But, while I was there waiting for hubby to show up with the truck I saw people buying some of what I just donated. One guy walked by with a couple pieces of counter top (which I thought would be the hardest for them to get rid of since they were odd sizes and almost threw them away instead) and he proudly told me he was going to make an outdoor fish cleaning station to make his wife happy.